Passion fruit juice is a beverage that is made from the pulp and/or the seeds of the Passiflora plant. Passion fruit is technically a berry and comes in three different varieties: purple passion fruit, yellow passion fruit, and giant passion fruit. You can buy commercially-prepared passion fruit juice cocktail in the store, but you'll gain greater health benefits if you prepare your own passion fruit juice at home. The calories in passion fruit juice come almost entirely from carbohydrate. But the number of carbs in passion fruit juice will depend on the brand that you buy or the recipe that you use to make it. Many commercially prepared passion fruit drinks are actually blends made from several different types of juice. For example, Welch's brand Passion Fruit Refrigerated Juice Cocktail is a blend of grape, apple, and passion fruit juices. The juice also includes high fructose corn syrup (an added sugar) and other ingredients. An 8-ounce serving of this juice provides 140 calories and 34 grams of sugar. But cold-pressed passion fruit juice made with no extra ingredients provides 60 calories per 12-ounce serving and only 13 grams of carbohydrate. The estimated glycemic load (GL) of passion fruit juice is 13. Glycemic load is an estimated glycemic index that takes into account the serving size of a give food or beverage. There is no fat in passion fruit juice. Passion fruit contains less than one gram of polyunsaturated fat. The only way that a passion fruit recipe would provide any fat is if the ingredients included a fatty liquid, such as coconut milk. There may be up to one gram of protein in passion fruit juice if the serving size is twelve ounces. But most varieties of passion fruit juice that you make at home or buy in the stores will contain zero grams of protein. Whole fresh passion fruit contains small amounts of certain vitamins and minerals. For example, a whole raw passion fruit contributes 5 mg of vitamin C, or 7 percent of your total recommended daily intake if you consume a 2,000 calorie per day diet. You'll also benefit from getting 2 percent of your recommended daily intake of riboflavin, iron, magnesium, phosphorus, vitamin A, and phosphorus. When you drink passion fruit juice, however, your intake of the vitamins and minerals will most likely increase because you are consuming the juice of more than one fruit. For example, some commercially prepared brands of raw passion fruit juice claim that you'll benefit from 15-50 percent of your daily intake of vitamin A and 30 to 80 percent of your daily intake of vitamin C.
If you purchase a commercially-prepared passion fruit juice cocktail, your vitamin intake may be even higher since the juice is blended with the juice of other fruits. Fans of passion fruit juice say that drinking the beverage can provide several health and beauty benefits. For example, vitamin C (L-ascorbic acid) is essential for good bone structure, cartilage, muscle, and blood vessels. It also aids in the absorption of iron and promotes wound healing. Vitamin C must be consumed in the diet because our bodies are unable to make it. The amount of vitamin C in the passion fruit juice you consume will vary based on how it is made, but you may get up to 80 percent of your recommended daily intake. You'll also get a healthy boost of vitamin A when you consume passion fruit juice. Vitamin A is essential for healthy hair, skin, and mucous membranes in the body. It is essential for bone and tooth health and is also important for normal vision and a healthy immune system. How should I select the best passion fruit for passion fruit juice? Look at the skin of the passion fruit before you buy. Smooth skin indicated that the fruit is not yet ripe. Instead, find one that is large and heavy and has slightly dimpled for a ripe fruit. You can use either yellow or purple passion fruit if you make juice at home. Yellow passion fruit is used more often for commercial juice production. However, the purple variety is more commonly found in stores and preferred by many for its flavor. Do I need to peel the passion fruit to use it in juice? You won't use the skin of the fruit when making juice. Instead, you'll split the fruit open and scoop out the pulp and the seeds. If you choose to use the seeds to make passion fruit juice at home, you'll press them through a fine strainer to extract the juice. The seeds are large and soft so this process doesn't take much work. 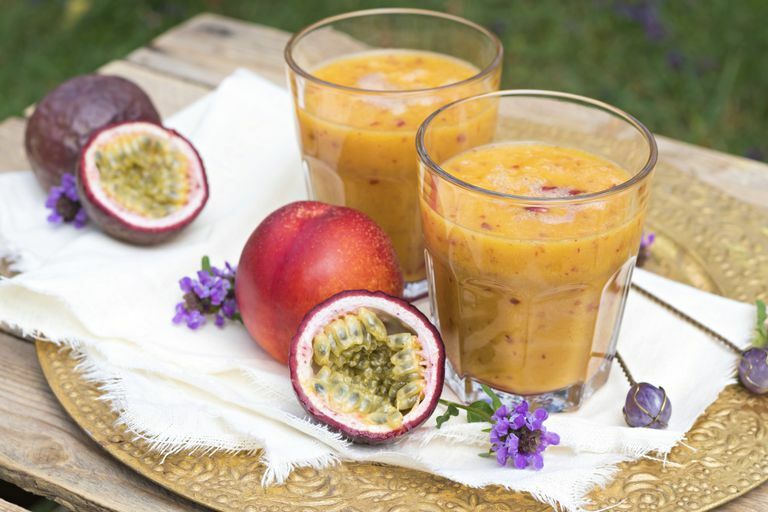 Is passion fruit juice healthier than whole raw passion fruit? You may gain more vitamins and minerals when you consume passion fruit juice, however, you also get a substantial boost of sugar without the benefit of fiber. One whole raw passion fruit provides about 2 grams of dietary fiber. Fiber helps to slow the absorption of sugar so your blood glucose doesn't spike after drinking. Fiber also provides other health benefits, so health experts generally advise choosing whole fruit over fruit juices. There are different passion fruit juice recipes and variations, but most follow the same basic steps. Begin with 3-5 fresh, whole passion fruits. Deseed each fruit and scoop out the pulp. Add the fruit to a to a blender with 4-5 cups of water. Add table sugar or a non-nutritive sweetener such as Equal. Strain to remove fruit pieces. If you prefer, you can press the passion fruit seeds and add that juice to your blended juice. Serve over ice with a slice of lemon or lime. Use passion fruit juice as a stand-alone drink. Combine it with sparkling water for a non-alcoholic sparkling cocktail or blend with other fruits and veggies for a healthy passion fruit smoothie. Some latex-allergic patients will react to passion fruit and other fruits, including papaya, avocado, banana, fig, melon, mango, kiwi, pineapple, peach, and tomato. If you plan to consume passion fruit and have a latex allergy or have a history of latex anaphylaxis you should be blood tested to see if you may also be allergic to passion fruit. According to medical sources, symptoms are usually localized to the mouth area. Severe reactions are rare. Allergenic Food and Allergens. The University of Nebraska-Lincoln. Institute of Agriculture and Natural Resources. Vitamin A. National Institutes of Health Office of Dietary Supplements. Consumer Fact Sheet. 2013.